In ten short years, from 2005 to 2015, the number of people turning 65 each year exploded from 2.2 million to 3.5 million. Many of these older Americans are increasingly choosing to rent. With this surge of older renters, developers are building age-restricted or so-called active-adult lifestyle apartments. These apartment communities are designed specifically for older renters and are commanding a significant premium for doing so. First of all, why are older Americans choosing to rent? 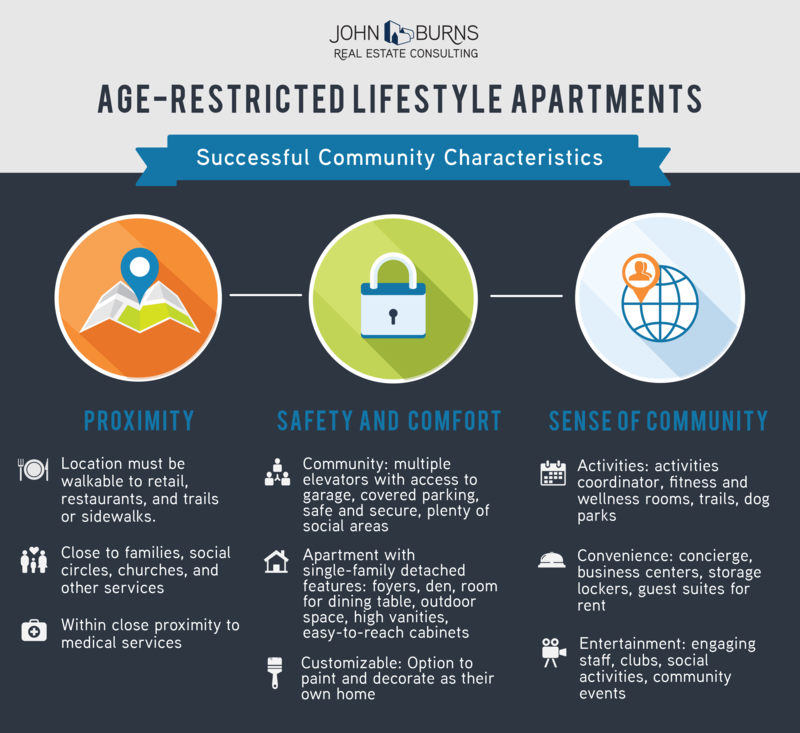 What makes a successful age-restricted lifestyle community? How much more are rents in age-restricted apartments than market-rate apartments? Interestingly, successful age-restricted lifestyle communities are able to charge a premium over market-rate communities. We found that age-restricted properties may achieve a 12% to 35% premium above market-rate apartments, depending on local market competition, property specification levels, and types/varieties of property amenities. 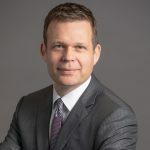 However, it is important to note that age-restricted properties charging significantly higher premiums above market-rate units resulted in slower absorption paces. Additionally, operating costs could also be higher in lifestyle communities due to activity programming and more amenities to maintain. 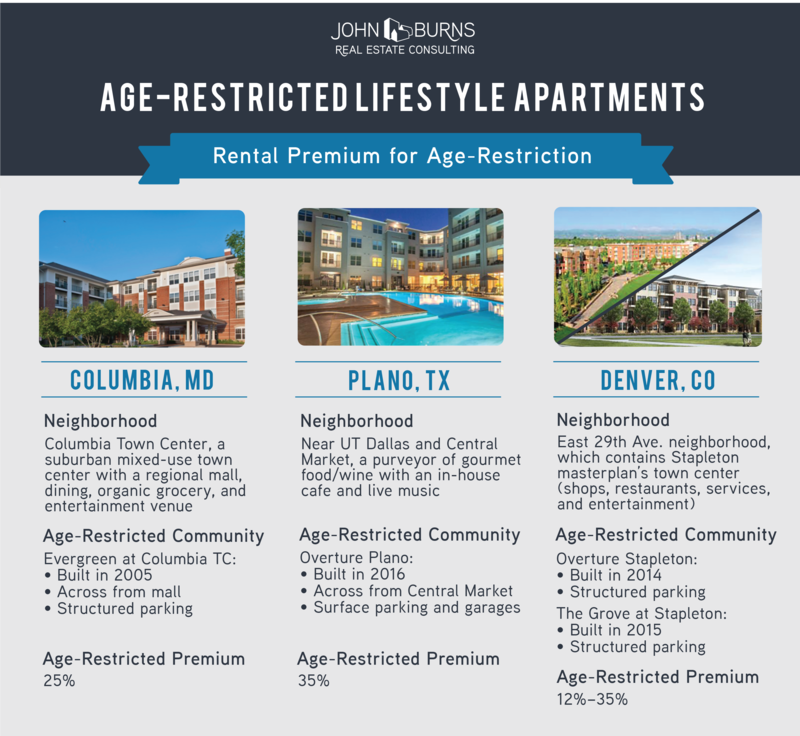 We compared three successful age-restricted apartment communities to nearby market-rate apartments with similar building types and ages. The examples below are in suburban, walkable locations that bring the best of urban living to a more affordable suburban environment (what we like to call surbanTM). Looking ahead, an aging population and the increasing propensity to rent result in demand for age-restricted properties. We believe that demand for age-restricted rentals will remain solid in the years to come. 1From our firm’s newly released book, Big Shifts Ahead: Demographic Clarity for Businesses.